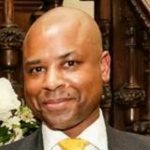 In the week of International Men’s Day (this year's theme is positive male role models), Brian Stanislas, Product Manager, Civil Service Job Share Finder, writes about men who lead by example to promote the benefits of job sharing. 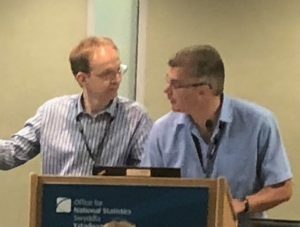 On 3 October, at its Newport office, the Office for National Statistics (ONS) held a Job Share Event that was designed and delivered by male colleagues. ONS Statistician Nicholas Palmer led the creation of the event. He contacted me for support having attended presentations I delivered to promote Job Sharing and Flexible Working at Civil Service Live in 2017. Nicholas organised live streaming facilities to other ONS sites, as well as to the onsite conference room accommodation, delivered the opening of the event and chaired the Q&A discussions. Dr Alex Lambert (ONS Deputy Director) presented his case study of how job sharing enhanced his work / life balance. 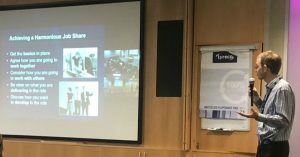 Alex, formerly a Job Sharing Director at the Defence Science and Technology Laboratory (Dstl), had previously presented similar sessions with me and the Civil Service Job Share and Alternative Working Network (now Civil Service Flexible Working Network) at Civil Service Live in 2016 and 2017. Alex gave a presentation on his personal experience of being a job sharer and his top tips for making the job sharing partnership work. 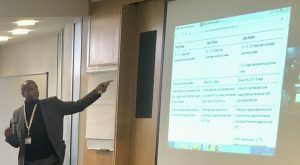 I delivered a ‘Show & Tell’ demonstration of the Civil Service Job Share Finder highlighting the site’s new Resource Library feature and cleaner site design. The event, which was well attended by men and women equally, was particularly dynamic. A prime example was during the Q&A session, when attendees put questions to Alex, Nicholas, Scott Howell (ONS Divisional Director of Service Centre and Chief Commercial Officer) and me as the Expert Panel, and ONS job sharers and their line managers confidently joined in to provide further information to broaden and enhance our responses. This was my first experience of a job share promotion event where the organiser, a job share case study, line managers of job sharers and the guest subject matter expert (me!) were all men! An excellent real world example of senior male leaders role-modelling working flexibly and championing flexible working which, in turn, supports gender parity. 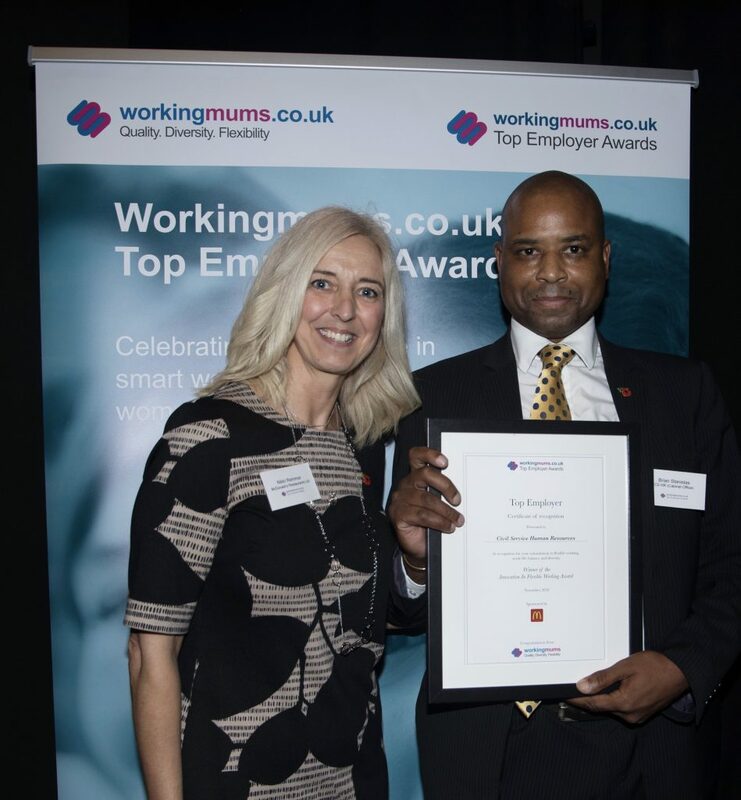 On 6 November I attended the Workingmums Top Employer Awards 2018 event in London. 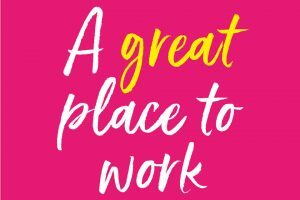 The awards recognise employers who have embraced the business benefits of flexible working and have been proactive in seeking to recruit and retain talented staff, particularly working parents. The theme for this year’s event was ‘Workingdads’. The keynote speaker was Gavin Shuker MP. He spoke about the Women and Equalities Committee’s work relating to dads, and the actions he personally takes to promote flexible working in support of gender parity. I attended the ceremony to represent Civil Service Job Share Finder, which won the Innovation in Flexible Working Award on the night. The Civil Service Job Share Finder is an online job-share database that helps civil servants find and manage information so that they can make compatible job-share matches with other civil servants. Civil Service HR was also recognised for its work in promoting job sharing across the Civil Service. The judges said that Civil Service HR was continuing to push the agenda forwards in ways that were transferable to other employers and was a key influencer on the private sector through sharing its experience. As the Product Manager of Civil Service Job Share Finder (as well as the Civil Service Careers Site), this recognition of what the Civil Service is doing to promote flexible working is truly gratifying. And it's all part of our drive to make the Civil Service the UK's most inclusive employer by 2020. If, after reading this blog post, you decide to look for your ideal job share partner or just want further information about job sharing, sign up to the Civil Service Job Share Finder and see where it takes you. Thank you for a really interesting blog. Congratulations on the award.